First, let me just say I am INCREDIBLY lucky! I am so excited to get to work with some fantastic bloggers on this new endeavor. At the end of each month, we will be presenting some awesome tips, tricks, and ideas that are perfect for your classroom. 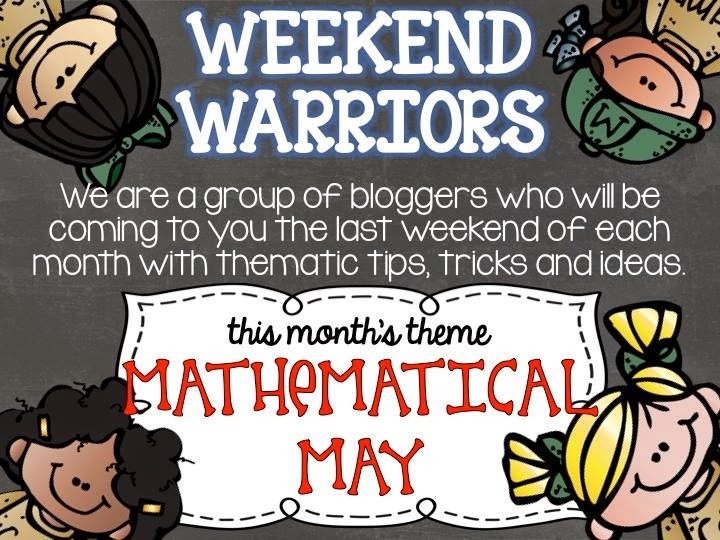 I am so excited about this month's theme. 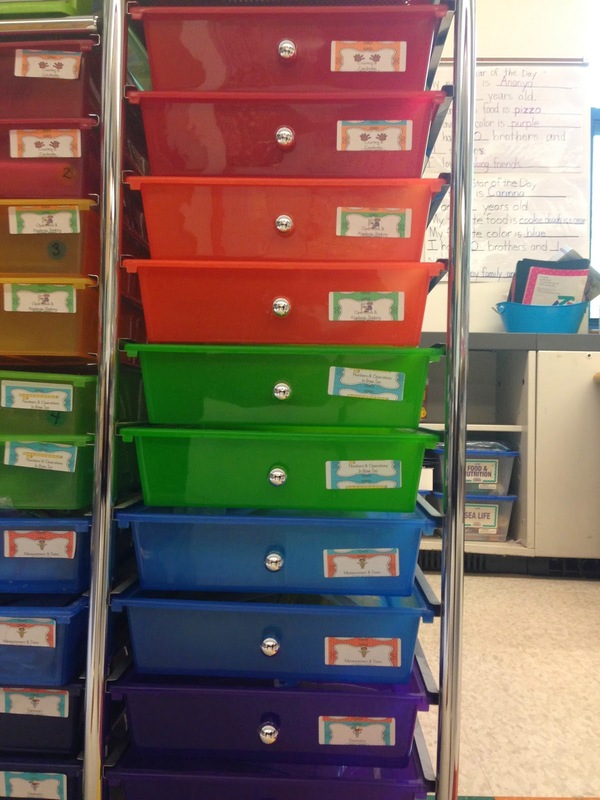 I have been working on math organization in my classroom for the past few months. 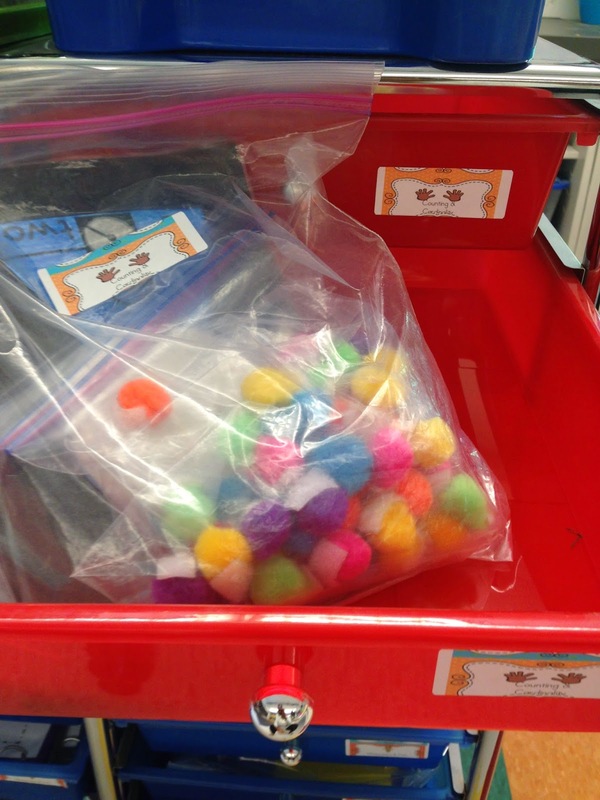 I've reorganized my centers, labeled drawers, and created activities all based around the Common Core Math objectives. After completing some mid year math assessments, I was noticing a small group of kids needing more support in one math objective than another (not a big surprise). But I was really stuck on how to get those students more math time around that specific skill. I just felt there wasn't enough time to help them improve. So, I decided to make time. I cut 10 minutes out of our day that was just for math skill improvement. Nothing else. Monday through Friday students rotate between five different math centers. A group of students start at Counting & Cardinality on Monday, Operations & Algebraic Thinking on Tuesday, Number & Operations in Base Ten on Wednesday, Measurement & Data on Thursday and Geometry on Friday. If a particular group needed more time to strengthen their skills in Geometry, I simply have them stay at that center the following day. This idea sounds great…but I struggled with implementation and resources. I had a few questions for myself. Do I have enough variety of materials at every center? Do I choose what goes out or do I let the kids choose? How can I ensure each child is successful? I created some labels to place on our tables so students would know where they were going each day. 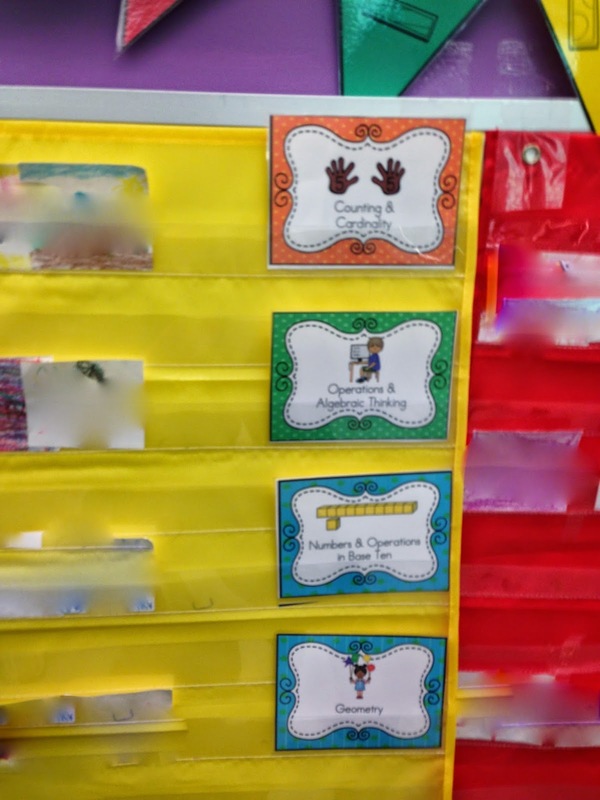 The labels matched our center chart pictures. 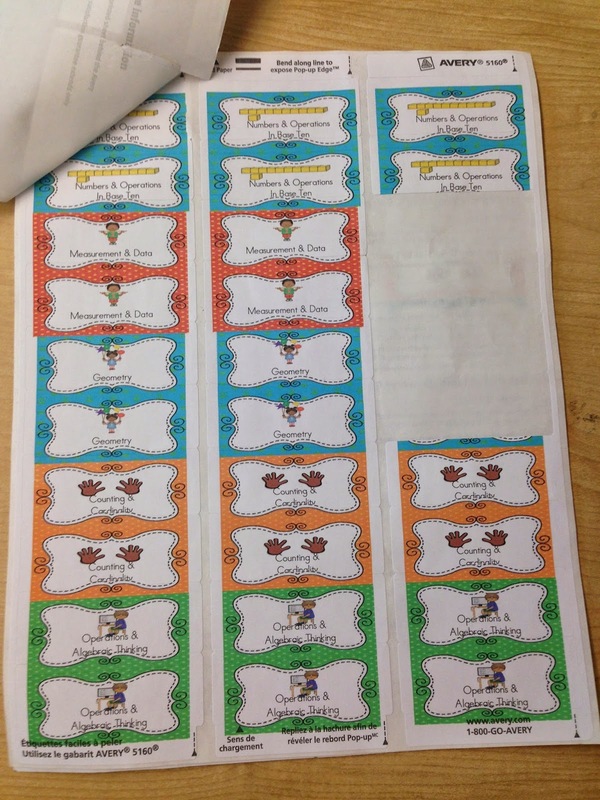 Then, I placed these labels on all math activities I had. It was very time consuming to go through every single activity and determine which Common Core skill it focused on. But the process was incredibly helpful, as I was able to determine which skill needed more activities. 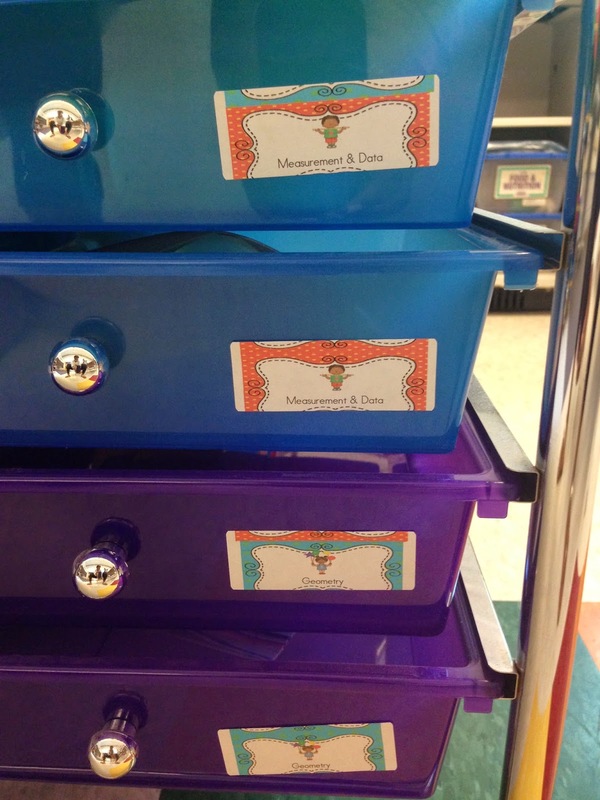 This labels went on my rainbow math drawers so I could match up activity with drawer making for an easy clean up! In the beginning, I was putting most of the activities away myself. 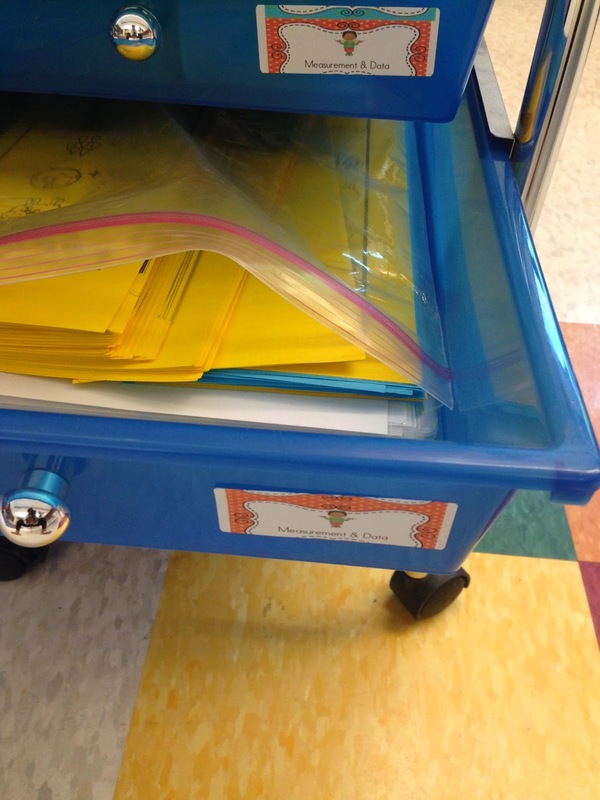 But now, a few kids from each center will grab the activities, match them to a drawer, put them away themselves! I love my kids…I never asked them to do this they just started helping all on their own. The labels are truly a life saver. Alright so I've organized, labeled, established a system for rotation and clean up, but how would I could I check for success? Of course I do informal assessment as I work with kids at their centers, but I wanted a way to keep track of their progress over time…. Head back here tomorrow for Part 2 of Mathematical May. 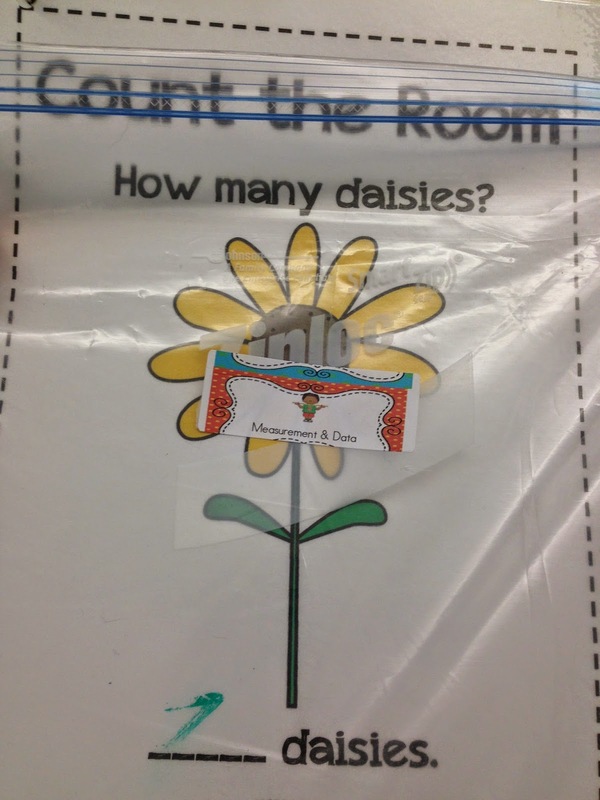 I'll show you just how quick and easy it is to keep track of kiddos learning. Want some more math tips? These Weekend Warriors have some great ideas for you. Enter to win $10 towards anything in my TpT Store! I LOVE the labels! The visual cue is SO important for those little guys. Brilliant, my friend! I like how you used the same labels to organize the supplies and the kids. What a great idea and WOW! it looks like that would take you a while to organize and get started.... good for you! I may have to try this.